Mechanisms of wear and corrosion; Weld surfacing; Thermal spray processes; Electrodeposited coatings; Physical and chemical vapour deposition techniques; Polymer coatings; Finishing of surface coatings applied by welding and thermal spraying; Ensuring quality in surfacing; Safe working in surfacing; Industrial applications of engineering coatings; Glossary or terms used in surfacing. to the literature on the subject. This new edition describes the many methods by which surface coatings or surface modification can be carried out to delay surface degradation and prolong the useful life of engineering components. 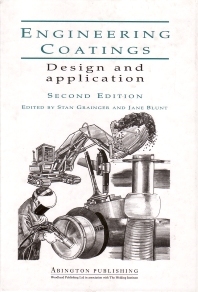 Since surface technology has advanced in many areas, new techniques such as the newer thermal spray processes and laser surfacing are now covered and the book has been expanded to include more coverage on corrosion. industrial practice is an invaluable guide to methods which have the potential to save money in many industries concerned with wear, corrosion, welding and thermal spraying of engineering components.